The 1921 D383 Koester Bread Baseball Card Set includes 52 cards measuring 2" x 3 1/4". The card fronts are identical to the E121 American Caramel issue, even though not all players depicted were included in that set. The card backs are blank. 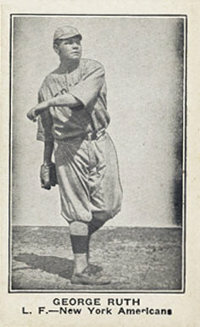 D383 Koester Bread Cards depict either a New York Giants or New York Yankees player. This is due to the fact that the 1921 Koester Bread Set was created to commemorate the first subway series - World Series. Hall-of-Famers included in this issue are: Frank Home Run Baker, Dave Bancroft, Jesse Burkett, Frankie Frisch, Waite Hoyt, Miller Huggins, Hughie Jennings, George Kelly, John McGraw, Babe Ruth and Casey Stengel. CLICK HERE if you want to sell your 1921 D383 Koester Bread Baseball Cards.